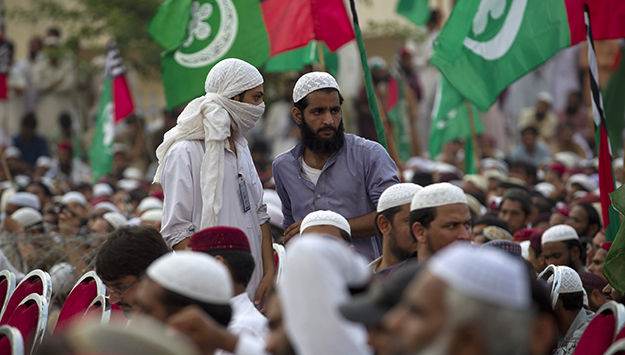 Supporters of the Deobandi Sipah-e-Sahaba group in 2013. In both general and more informed discussions in Pakistan and beyond, sectarian violence in Pakistan between Sunni and Shi‘i groups is almost without exception referred to simply as Sunni-Shi‘i violence. But such a characterization is a misnomer. Two of Pakistan’s three major Sunni subsects, the Ahl-e-Hadis, and to a lesser extent, the Barelvis, may have antipathy toward the Shi‘a, but rarely express such sentiments through violent activity. Instead, since the 1980s, it is segments of the Sunni Deobandi community and Ithna Ashari Shi‘a (or Twelvers) that have been at war with one another and have developed an infrastructure and discourse—aided by governmental forces in Pakistan, Iran, and Saudi Arabia—that is designed to combat the other side. Smaller Shi‘i sects, such as the Dawoodi Bohras and Imami Ismailis, have been victims of Sunni Deobandi violence, but have no significant involvement in militant activity. This report aims to explore the causes of the surge in sectarian violence between Sunni Deobandi and Shi‘i Muslims in Pakistan since 2007, identify the networks behind it, and offer solutions for rolling back the surging tide. Much has been written on the history of conflict between Sunnis and Shi‘a in the Muslim world, as well as tensions between Sunni Deobandis and Shi‘a in South Asia both prior to and after the formation of Pakistan. These secondary sources inform the first section of this report, which provides a brief overview of the history of Sunni-Shi‘i conflict in Islamic history and the divide between Sunni Deobandis and Shi‘a in Pakistan. Next, the report examines the contemporary surge in Sunni Deobandi and Shi‘i violence, focusing on the most active zones of conflict between the two groups since 2007: Punjab, Baluchistan, the Kurram Agency and nearby regions, and Karachi. Other areas, such as Chitral, Gilgit-Baltistan, and parts of interior Sindh, are not discussed in detail due to the relative paucity of violence involving the two sects in these areas since 2007. The report then identifies five trend lines in Pakistan’s Sunni Deobandi-Shi‘i sectarian conflict, which, with the exception of one, are all negative. Finally, the report concludes with a series of recommendations, mainly for the Pakistani government, that will help it reduce and eventually eliminate the scourge of Sunni Deobandi-Shi‘i Muslim violence. This project was made possible by a generous grant from the United States Institute of Peace's South and Central Asia Program. Is Russia drawing down in Syria? What does Helsinki mean for Jordan?